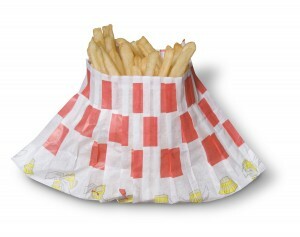 Let’s talk about french fry bags. Since their invention they’ve been less than effective in their ability to contain their contents. Some are floppy and flimsy. None can stand upright, which means the fries spill out over the food tray and the bag and every other inconvenient spot, in your car, your clothes, the pavement – everywhere. You spend more time focusing on where the fries have fallen then the actual enjoyment of tasting their flavor and eating them. Now you can have your fries and eat them too. GreenDustries has invented the Magic Bag – a simply constructed container that expands and sits neatly in the center of your console or lap, preventing anything from spilling out. Magic Bag also provides better heat retention, and puts the focus on the ability to enjoy the food, whether buying fries or chicken tenders. Can be opened into a basket shape, enabling the condiment to be poured easily over the top without mess. Contains the crumbs. Ninety percent of french fry cartons have an opening at the bottom so crumbs tend to fall out. Magic Bag has no opening, containing the crumbs. Provides better sanitation. With traditional fry cartons, people either dump the fries into the carry-out bag or the lid of a clamshell or better yet use the tray which is questionably sanitary. 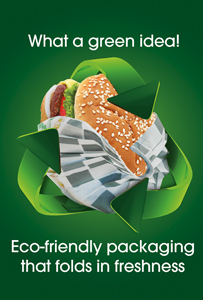 It’s all about giving consumers what they want: a clean efficient, no mess method of eating. When the inconvenience of the packaging overrides the pleasure of eating the food, it’s time for fast food operators to take notice. Is it magic? Or is it just practical packaging? Thank you, keep coming back for more! magnificent points altogether, you simply won a emblem new reader. What would you recommend about your publish that you just made some days ago? Any certain?